Nosson, as Shliach in California had a car, and he never hesitated to lend it out. In addition, he gladly taught anyone who wanted to learn how to drive, to drive with his car. When I finally got my license, and wanted, on occasion, to borrow his car he always gladly gave it with a smile. It was a simple matter of asking for it, and it was yours to borrow. One morning I desperately needed to go somewhere and asked Nosson for his car. However, to my dismay, he told me that he needed it that day and could not lend it out. To my surprise, when he saw how distraught I was, he offered to drive me. "If I can't give you my car, at least let me drive you," he said. This exemplifies what Nosson was in my eyes. Whenever or wherever, he was always willing to go out of his way for another, although he was absolutely not obligated to do so. It was not done in an ostentatious way, it was done quietly, without any need for fanfare. Proud of my 14 yr old son who 7:30 AM this morning woke up before me, without a coax, raced with me to lay, say, and raise one for a dear friend of his. Nosson Dietsch A"H.
I remember when my son was 8 yrs old, he turns to me to ask" Daddy, can you believe that man grabbed me and put me on top of his shoulders and we danced around the Bima?! What a thrill and a unforgettable memory you gave that boy. Not only did I believe it but because of Nosson I continue to believe. I wake up to the dreary sound of rain bouncing off my window, to the painful ache pounding my heart. A dear friend is gone, and even the heavens seemed to notice. It surprises me that I am so overcome with emotion, after all, I only knew him for a short time and I our time together was infrequent, yet the tears are still trickling down my face. We walk towards a freshly dug grave, and I am still in shock, it seems unreal. I want to scream "Nosson, Don't go - I still need you". And while his casket is being carried by the mourners, as friends and family are standing in shock, I notice the sun creeping though the clouds and finally chasing them away, causing the birds to suddenly chirp. It was as if Nosson himself was trying to comfort us. While the time I spent with Nosson was relatively limited, the pain is so real. With Nosson, our every interaction raised my spirits. He was like a sun breaking through my clouds. He had such a zest for life that was contagious, and no matter how down I was feeling at the moment - he lifted me up in such a sincere and cheerful way. Nosson, you were an inspiration for me how to live life to its fullest. You continue to inspire me now by how many lives you have affected. I will try to take that inspiration with me throughout life's journey, to be a sun in the clouds that threaten. I had the privilege of speaking by the 2nd yahrtzeit of Nosson, in Nosson's shul - I'll share what I touched on that night. "Nosson's yartzeit falls out during the weeks of Kedoshim and emor. Appropriately, here we are, gathered to speak about Nosson - Kedoshim Emor. When I heard the news on that day, I had just landed in Atlanta from a visit. visit to New York. Of course, as Nosson’s best friend, I got right back on a plane to be here. The next day, we, his friends, gathered and shared the same feeling over and over again: We each felt that he was our closest buddy, someone who really knew how to listen and even better how to respond. There's a story told - Many years ago of a king and his son who crossed the hot desert. Soon the prince fell ill, dehydrated from the journey and badly in need of water. The servants all offered ideas of where to go for water but the king was not interested. He didn’t want them to race their camels to a nearby town or to squeeze juice out of the fruit they had along. He didn’t want them to pay forty bucks for a bottle of pure Evian at the highway gas station. Instead, the king ordered a well dug right in that spot, with a sign to identify it posted nearby. “Right now,” the king explained to his son, “we can find water quickly and easily. “But maybe one day—maybe many years’ from now—you’ll be traveling here again. Maybe you will be alone, without the power and privilege that we have now. Then, you will still have this well to quench your thirst. And if it is covered over? This signpost will remind you of where to dig and you will eventually find the lifesaving water. In this week’s Parsha, the first posuk in today's chitas- the Torah lists all of the Mikraei Kodesh- yomim tovim that contain powers such as Freedom on Pesach or Forgiveness on Yom Kippur. But seriously: In this day and place, can we afford to wait until the Seder that happens once a year to taste the freedom we need every day? So we think of the prince in the desert and his thirst for water. On Pesach we can stop and internalize freedom for the entire year. On Chanuka we can draw in light and clarity for the months and year ahead. And on Lag baomer - the essential theme is ahavas yisrael - which Nosson was all about. Nosson passed away PUNKT on Lag baomer. On a day that was already—and will always be—filled with extra joy, weddings and live music, a full-on celebration. Knowing Nosson, he had his way with G-d. If what happened is all part of His master plan - something we can't understand - Nosson so to speak had one-up on G-d. Nosson made sure that the day he left this World, was on a day we would all, so to speak, celebrate. It wasn’t enough for Nosson to be remembered. He also wanted to be a reminder—to be a Mikra Kodesh, a day of holiness that will make us improve our friendships, liveliness and passion-to-act. When it comes to being a better friend to each other, Nosson will always be our well in the desert, and Lag Ba’omer will always be our sign-post. We are each one of a thousand people who thought of Nosson as his closest friend. Now it’s our turn to dig, and become that friend to a thousand others. For our age-group, Lag Baomer will always be the day of how to be more like Nosson Deitsch. Nosson, know this. I don't write so good and I don't sing too good and you didn't sing too good either. But how was it that your songs were so joyous, your passion and faith were so envied and your love and dedication to Hashem, were so genuine? Your qualities were the benchmark for many of us to strive meet. There was always a current running through our " Corner " community when we were told you would be in town and me and my kid would come racing to share prayer,lessons and, good times with you. You made my kid and me so happy. The time spent with you was sensational and way to short. Your teachings were fabulous and very welcomed. You provided us a motivated path for observing,learning and celebrating our Yiddishkeit You left us with the task for making, the way you did, moments genuine and sensational for others. In honor of your memory we'll try our best. Kinus Hisorerus from Sruli Deitsch on Vimeo. In honor of the first Yohrtzeit of Nosson Nota Deitsch a short video was put together by a group of his friends showcasing the profound impact he had on all who knew him. If you do not wish your story or good initiative to be publicized, please say so in your email, but please do not withhold your story from Nosson's family. This upcoming Sunday will mark a lot of things. Birthday, weddings, dinners, get-togethers, and it will also mark the Yartziet of my dear uncle, Nosson. It is hard to believe that a year has passed since Nosson, a very alive being, is no longer with us. My heart aches thinking about all the suffering my family as a whole has gone through. No tears can wash away our sorrow. I wish I had something in my power to just wipe it all away. You know the saying “absence makes the heart grow fonder" I can vow it does. Every day I’m longing to chat with Nosson online so he can tease me about all sorts of stuff. Every day that passes I think about him and my missing him only increases. I must say he sure did get me angry at times but all in all he was THE best uncle anyone could ask for. While he was alive for those 21 years I will not say I enjoyed when he teased me but now… how I wish I could have him come tease me! If only! Every day I realize that I have to thank G-d for everything he gave me. Apparently Nosson wasn’t supposed to live till 22 physically but we sure feel his presence spiritually. When I do an act of goodness and kindness, I know Nosson is smiling down at me cheering me on "ya! That’s my niece!" by you doing good deeds, you are fulfilling dreams of countless people. You do Mivtzos and bring Moshiach, Taa Daa no more pain! Taa daa no more longing! It’s almost as if we are given clear directions and we are reading them upside down! If we would only turn them over then Moshiach would be here. Remember Heygiah Z'man Geulas'chem this is the time not tomorrow. Today! Help make it from dream to reality! Just a few short months ago I wrote a letter expressing my sorrow on the loss of my dear friend Nosson. I finished with the words “Nosson’s smiling presence will forever remain with me, as a void that can never be filled.” But little did I imagine that the void would grow wider, that the wound, still fresh, would be so painfully torn open. Of course we knew that Levi was ill, and we knew too that Levi’s illness was one of the very few things that could ever worry Nosson. But Nosson’s confidence and unwavering enthusiasm convinced us that no brother of his would ever be overcome by any onslaught, however intense. To those who knew Nosson, no form of tragedy could seriously be associated with him or his family, it was simply too incongruous. Nosson and his family had been through enough already, sorrow was something that they deserved to place firmly behind them and never revisit. Then – on a sunny day of joyous celebration – tragedy struck. When Nosson was so tragically torn from us, we were united in a grief that will never entirely heal. First there was only shock, but with the passing days the shock turned to dismay and then to bleak sorrow. Never again would our lives be brightened by Nosson’s enthusiastic presence. The very impersonation of life itself had died. And there was pain, pain for the unimaginable shock, the terrible dismay and the infinite loss that Nosson’s mother, and indeed all the family, must suffer. That shared tragedy, created a common bond between all of us – Nosson’s friends, and you – his family, who grieve for him the most. In the following months, the threat of Levi’s worsening illness loomed heavy on our consciousness. I never met Levi, and the same applies to many of my friends, yet his situation was constantly on the agenda. At every opportunity, at every Farbrengen, a Le’chaim was said that Levi Yitzchak ben Cyrel should have a Refuah Shleimoh. And we believed that Levi would have a Refuah Shleimah. We knew that Nosson’s brother must love life as he did, and that Levi would fight and never surrender. And Levi did fight – till the bitter end. And the end was bitter. This is not just the tragedy of a young life lost, but the tragedy of a family. A mother who has already suffered far too much. A young widow – who valiantly lived to preserve a hope, and fought to create a certainty – her life cut in half, her hope conclusively crushed. Her young children bewildered. Orphaned. Will they even remember the exuberant father of their earliest youth? Each of Levi’s siblings has lost yet another irreplaceable piece of their own lives. I do not think I am alone when I say that my heart is torn for you, for Levi’s mother, his wife, his children and all the family. The hundreds of Bochurim who loved Nosson so, in some small measure, sense the pain of his family and share it. I cannot offer words of comfort, I do not know how. But I want you to know that I wish I could, and I want you to know that because of Nosson you are less alone. He has made a HUGE impact on my life! This moitzei shabbos, I went on collive.com and to my shock I saw the untimely passing of yet another deitsch. I was shocked. How could this happen again? I remember about 2 weeks after lag baomer, I was reading one of those weekly lchaim pamphlet and the slice of life column was about our dear nosson. As I read a few things about his remarkable character, I was deeply touched and moved - especially by his unseen ahavas yisroel and the fact that he knew the whole Tanya by heart! That night, I checked on collive for his nosson deitsch, OBM, 21 and I actually felt the intense pain of the commentators. I also discovered this blog so I went on and spent the whole night (not kidding, 'till 7:00 AM) reading and crying my eyes out! Also, i was gathering inspiration; Nosson's unique personality is something that I have never seen before in my life and I marvel at how a person can be so full of good and joyfulness. It puts things into petspective, a lot! For me, nosson epitomizes the essence of what a chossid is and what is right. I cried that night because I wondered how hashem could do this to us and shatter so many peoples minds (including my own, even though I never had the zechus to meet him). I decided that if everyone nosson knew would take something on, it would at least make this crazy time a little worthwhile, so right then and there, I wrote an email to Chabad.org asking them to make the mitzva campaign like they did for the Holtzbergs a"h. They told me it was a very nice letter but nothing came out of it. The reason I'm writing all this is because now, lets make our own campaign and BREAK THE GATES OF HEAVEN OPEN WITH OUR MITZVOS cuz' this overly messed up golus has got to end!! I guess I'm leaving the details of this campaign up to the heads of this blog (even though I'd be glad to help- you have my email) but it should definately be leleui nishmas nosson notah Ben zalmen yuda a"h v' Levi yitzchok Ben zalmen yuda a"h. Nosson would have for sure jumped to do something like this and help so many yidden to get closer to their tiere tatte in shomayim. Just to add, since I heard about him, nosson has been my role model and if was/am ever not sure what to do in a situation, I think to myself, "what would nosson do?" i always know what to di then- what the rebbe wants and what would do and make hashem proud. You left this world just a short while ago on lag ba'omer. It's a day that will always remind me of you and what you represent to me. I never knew you and until your passing, I didn't even know of you. But now I know of you well and of joy that was a part of you. I watched a favorite video of you in which you are dancing while others are standing stiff abd erect. That's what you stand for. You show how the time and place for simcha is every time and every place. Every time I try to smile een though I don't rly feel like it, I feel an instant connection to you. I feel as if I am helping you do what you would have been doing if you were down here with us physically. To me you will forever be a symbol of true joy and knowing that makes me feel more and more of an urge to actually meet you. Nosson I am sure that you are up in heaven at gods torn asking and beseeching of hashem to bring moshiach now so that you can reunite with all those whom you left behind and so that you can once again spread joy to every place and every person. Hoping to see you soon with the immediate coming of moshiach. It has been over 4 months and I have not been able to sit down and put anything on paper. However, now that we have a baby Nosson in the family (weird as it may sound but Hashem runs the world) it’s time to gather my thoughts and my strength to put ink to parchment. Yankel and I have a special relationship with all our nieces and nephews. They are all a part of our lives; a part of what we do. We try to include all of them in all the adventurous activities we do. I taught Nosson how to water-ski, an accomplishment he was extremely proud of. He managed to come by every summer to Sackett Lake from wherever he was. If he was in camp, it was on his day off with a car full of fellow staff members. He was never alone. His friends became our guests for the day. That was Nosson. For many summers, Nosson would try to put on Tefillin with one of our neighbors. Yossi tried, Nosson Ezagui tried, yet, the neighbor always had an excuse. This fellow was obstinate when it came to tefillin. This year, however, Yossi and Asher Chaim (Nosson’s cousins) asked him and he immediately said yes. I’m telling you, Nosson was doing something up in Shamayim to accomplish this. Nosson, you’re doing mivtzoim from up there!!! Nosson, your laughter, your comments on life, your stories of the people you met on mivtzoim, you’re joking with your siblings are all a memory now. I remember the first Friday night you joined your older brother in chazering a maamir; how proud you were to join the ranks; the gleam in your father’s eye that you reached that level. And of course the smile on your mother’s face that you were one of the boys. You were always so observant of life. You would always call your mother on a daily basis to make sure she was alright. You knew the latest and best phone model before they were available in the stores; the newest computer she should buy. You were her technical adviser. You could take any situation, analyze it, and find the good to comment on. If your siblings needed you on Yom Tov, you were there before they finished their sentence. We will all miss that positive attitude you exuded as well as your presence. Your father A”H always managed to find a hint about Moshiach in every Parsha. Some Parshas have them out in the open, while others have them hidden where you must search thoroughly for them. Please help us find Moshiach now…out in the open. Its been a long 4 and a half months. I have cried and choked endless times, and I get emotional and try not to talk about it, but i think it might be time. I knew Nosson on a personal level having called him and him calling me, farbrenging and laughing, making fun of each other. learning and bull-shoving. I have to say I have tremendous memories, fun times and erenste times, but what will become of all our memories ? A memory in it itself has no true value, it has no meaning, and it makes no difference if it lasts or not. The only true value of such memories is what we do with them, if we take it or a (part of it) to heart, cry about it, or laugh about it but do something to make that a lasting memory. ingrain it in yourself take it to a "Pnimius" it wont just be another memory of a best friend it will be a lebedike nosson inside of you. Like the rebbe explains "Benoigia" the frierdiker rebbe that the way that he is bachaim is through "Zaroi bachaim" zaroi being his talmidim. let us too take a memory apply it learn from it you have the power tzu machen nosson far a lebediker! We will never let you Go! You were the one who always helped us see the light. You were the one who always taught us not to hide. And through the lives that you've changed. You never left us, and we'll never be the same! Now there's one more thing i know that you will do. i hear you telling the heavens the revolution has begun. Nosson and I had a great connection the minute we met in the Chabad Yeshiva in Staten Island. I live a few minutes away and daven in that shul. When the Chabad Yeshiva moved in, in its first year, I met Nosson the first day. He was so charming, warm, kind and easy going that we immediately clicked. I looked forward to coming home from high school each day to chazer Tanach or Gemara which I learned in school that day. No matter what he was doing at the time, he always made himself available to help me out and teach me Torah. He learned with such an amazing superhuman enthusiasm, such that I had never seen previously in my life. It inspired me so much that during shiur each day I was able to pay close attention to my Rebbi and get involved in the discussions. I would tell my friend's about this wonderful new friend of mine from Crown Heights, who they had to meet, I guaranteed them that they've never seen a true Yeshiva Bochur who was this cool and outgoing. Nosson's energy and internal fire for Torah and Kiruv penetrated even my most distant friends, they too started to come over my house, from Staten Island and Brooklyn just to be able to learn with him and get help with Gemara. One shabbat I went to Philadelphia for a Bar-Mitzvah and I happened to be hosted by Nosson's brother Shaya. He treated us with such hospitality and warmth. When he told me he was Nosson's brother, I realized that the Chassidus personality of generosity, kindness and humbleness is in the family genes. From then on Nosson and I had a closer connection. I remember the nights he would walk me back home from yeshiva and we would talk in Chassidus, Gemara, Hashkafa and general life issues. He gave me Chizzuk when I needed it, he introduced me to Chassidus and its pious way of life it entails, he taught me how accept all types of people I encounter, and most importantly he taught what a true chassid is. Nosson did not merely say he was a Lubavitcher, he lived and breathed the Rebbe's teachings, he thrived on performing the chessed and kiruv which the Rebbe exemplified, he put his learning into practice; he lived a beautiful life of Chassidus. For three years I had the Zechus to have a deep Kesher with Nosson and his family. He invited me to sleep at his house for Shabbat; which I will always remember. That Shabbat uplifted my soul to levels I had never reached before; I shtaiged more in those two days than any other two days of my life. Just his hospitality alone, which clearly he learned from his parents, made me feel so comfortable in a new neighborhood I had never been in before other than to visit 770 and the Rebbe's kever. I remember I was learning Masechet Berachot at that time; I was up to daf Dalet or so. I did not understand what David meant when he said "Chasid Ani", which the gemara goes on to explain to mean that David would wake up before all other kings and judge tedious cases of purity and civil cases. Nosson's father explained it to me so well. I think that memory fits Nosson's personality trait of zerizus, alacrity. He had the right, similar to that of David, to tell Hashem: "am I not a Chasid"; when most bochurim were sleeping Thursday nights Nosson would be learning with a full heart, when bochurim would be talking after shacharit, Nosson would eagerly volunteer to give the daily "Hayom Yom" from the Rebbe's teachings, when bochurim would be tired of delving into a sugya, Nosson would go deeper and deeper. This past year Nosson and I reunited in Miami during a winter trip I took there. We had not seen one another in over four years; since he left Staten Island. I could not believe my eyes that Shabbat in the Chabad Shul on 41st street. I was seeing Nosson; I had never dreamed that I would see him there out of all people. We spent that shabbat learning and catching up on old times together. That reunification reignited a spark in me that had not been lit since the last time I saw him, over four years ago. I felt like a new person, a chiyus went through my body from the happiness I got from such a zechus to see Nosson. He memorized my phone number and called me after shabbat to set up a chavrusa for the rest of that year from back home in Staten Island. Low and behold, the rest of the year we would learn over the phone at night time. Sometimes even as late as one o' clock he was still in the mode to learn. Even over pesach when he was in virginia helping his brother out, he made time to learn with me. He told me over sefirat haomer he was finishing masechet Sota at a pace of one daf a day. I asked him if it is hard to learn at such a fast pace, he replied that it isn't easy but he has seen it more than a few times so he is familiar. He did not want to make me feel bad so he admitted that he was mesayem many times already. On the day of his petira he was up to daf 34. If I only knew that Hashem was going to take Nosson from klal yisrael, I would have taken advantage of the precious time I had with him. I did not comprehend how lucky I was to be a chaver of his until now. I did not fully realize what a zechus gantz klal yisrael had to have him Nosson on this earth with us for twenty one years, until now. I still do not fully understand his Gadlus, but I think I got a glimpse after seeing some of the memories people have of him. It's become a tradition of sorts, that every Motzei Shabbos during Melaveh Malka I visit this blog to read something about Nosson. It's my inspiration for the week ahead...a means of reminding myself that a chossid like this existed in our midst. Hashem knows it's high time to bring this chossid back...while we wait impatiently, another story, please? Don't stop sharing stories, anecdotes, memories, and writings of Nosson. 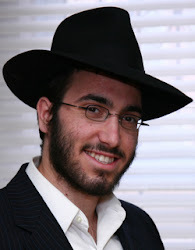 This blog is keeping chassidim alive. I had a dream. It was right after nosson died, perhaps a few days had gone by. We were still reeling, still letting the news sink in, still enduring the raw pain. I went on long walks, just to try to get away, to clear my head of all the strong emotions clamoring inside. I drank with my friends, to try to express my feelings, to try to escape the reality. I just needed a moment of peace, a moment to return to reality, a moment in time when everything comes in to focus, when I can be at peace. And I couldn't find it. We were all wandering, all distraught and torn, I just felt so frustrated. I wasn't living a normal life. So one night, just a few days after Nosson passed away, I retired to bed, more as an escape from the harsh reality of life than from fatigue. When I woke up, I didn't really take note of my surroundings, but it felt as if I had just walked in on a chassidishe farbrengen. To my surprise, who is standing there but Nosson! I went over to him, and with a big smile, he turned to me and gave me a powerful hug, so strong that it hurt. "Nosson, I knew you didn't really go," I exclaimed. "We all thought you were gone, you had me scared!" Nosson just grinned, and told me something to the effect that of course he is back, just like normal. I was standing there, just feeling so good, being reunited with Nosson. Well, as I told you earlier, it was only a dream. But it was a real dream, which means that I thought it was reality when it was happening, and more importantly, when I woke up in the morning, as I was lying in bed too lazy to start my day, I recalled my dream, and knew, I just knew, that it wasn't just my overactive imagination that had conjured up Nosson, but that Nosson is still with us, still loves us, and hasn't left us. And I was at peace, because Nosson had come to say hello. Make what you want of the story, but you won't be able to convince me out of my conclusion. Trust me, I am perfectly sane. Nosson, thanks for stopping by. Thank you for putting up this site! I too will always remember Nosson's electrifying smile. As Sholomo Hamelech says: "Tov Lev Mishteh Tomid." "To a good-hearted person, life is always a celebration!" That was Nosson. I have shared many of the stories about Nosson Notta with my children and it has made such an impressionable impact on them. The stories have encouraged them to have more Ahavas Yisroel, and I can already see how the stories have refined their midos. Not to mention they have given the kids a chayus for learning and Yidishkeit in general. Just last night before they went to sleep they asked, "Can you tell us a story of Nosson Notta?" as if they were asking for a Baal Shem Tov story! Indeed, Nosson is a Baal Shem Tov in our time. Nosson changed my life forever. I met Nosson through Rabbi Mendel Cunin, to study Tanya once or twice weekly. Over the months we became close friends. Every word of his, his joyous approach to life, his passion for Torah and mitzvas, among many other beautiful things, inspired and will always continue to inspire me to push myself to take on more mitvahs and strive to continue the path he made for so many of us. Thank you Nosson, I am just one of so many who had the high honor of an experience with you. Either seeing him, talking with him by phone, or merely exchanging phone and text messages with him had such a fundamental, foundational, inspirational, and lifelong impact on my life. And I'm sure there are so many more like me. From a speech delivered by Jack - a store owner who Nosson visited every Friday on Mivtzoim during his year in Los Angeles - at a gathering in honor of Nosson’s Shloshim in Yeshivas Ohr Elchonon Chabad. We would like to thank Jack for coming to inspire us and comfort us with his memories of Nosson. I own a trophy and award store in Northridge, California. Fridays are always very busy day for us and we sometimes lose sight of where we’re at – how our feet are really firmly planted on the ground… and the realization came whenever Nosson would come in and we would spend a half hour learning about and understanding what life was really really about. He was in essence my sunshine for many many weeks and years. We had a very very good relationship and – knowing him – I can unequivocally say that I became a better Jew just by being close to him. Ironically I asked Rabbi Rivkin, “My son, G-d willing, is getting married in August and I very much want my friend Nosson to be there…” because my son is getting married in Miami and we’re spending Shabbat there at the Chabad house, and I knew that Nosson was the Mashgiach there. Oddly enough on Lag Be’Omer some Chabad boy’s came over to my homage to my mother-in-law who had passed away, so I asked “where is this young man?” Later I learned tragically that he had died just a half an hour before I had asked where he was. I mean here’s a kid with Teffilin on and we have Chabad Rabbi’s here… …and Nosson just cracks up! There was always laughter with Nosson around. Even though he was a red-sox fan, which was probably – unfortunately – his biggest fault, we very much enjoyed our relationship. I look at a person like Nosson and I think to myself, “This boy has accumulated, in the short twenty years of his life, more wise words, more words of Torah and more words of Thought, than I would probably accumulate in two or three hundred years…"
Ironically, my son is getting married in two months from now and we’re staying at the Chabad House where – I believe – Nosson would have been… I just wish he would be there and I am sure that he will be there. On Tuesday night, the Shluchim of Yeshivas Ohr Elchonon Chabad, Los Angeles hosted a “Shloshim Gathering & Farbrengen” and published a special Kovetz in honor of HaTomim Nosson Notte Deitsch A”H. Nosson served as a Shliach in the Yeshivah – as part of the current Kvutzah – last year. The 19th of Sivan, the day of the Shloishim, would also have been Nosson’s 22nd birthday. 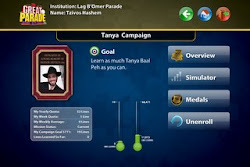 In the light of Nosson’s dedication to Tanya, all his friends agreed that the best way to honor his memory would be through projects associated with Tanya specifically. As was previously reported on collive, the Vaad Talmidei HaTemimim ran a special Mivtzeh Tanya Baal Peh in Nosson’s honor, and now we are pleased to present the “Kovetz Zichroin Nosson Notte”, in which Mashpi’im and Magidei Shuir from various Yeshives have participated. To download the Kovetz click here. 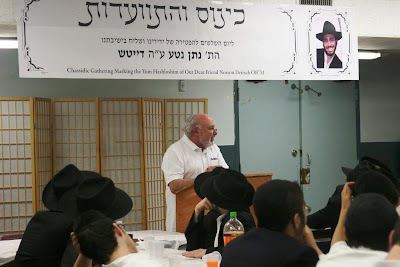 Amongst the Mashpi’im, friends and family members who addressed the crowd were Nosson’s brother Rabbi Mendy Deitsch (who flew in specially for the event), Rabbi Mendy Shapiro Mashpia in the Yeshivah, and Jack, one of the people Nosson used to visit on Mivtzoim every Friday during his time in LA. The various speakers spoke about Nosson’s special, always upbeat and enthusiastic attitude, his tremendous Ahavas Yisroel, his Hasmodeh in learning, his dedication and desire to give Nachas Ruach to the Rebbe, and the need for us all to learn from him – “veha’chai yitein el liboi”. 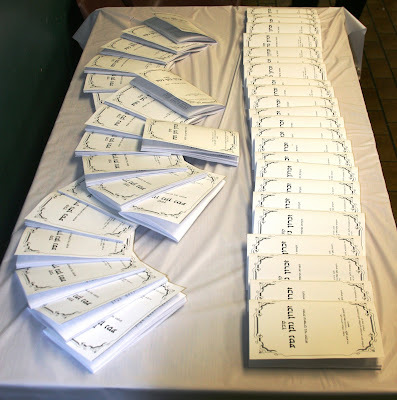 The event was attended by many Shluchim and Anash from around LA, by Mekurovim who’s lives were, by their own testimony “heavily impacted by Nosson’s inspiration”, as well as by the many bocherim who learnt with Nosson throughout the years and benefited from his influence as a Shliach in the Yeshivah. After the official program finished, almost everyone present remained to Farbreng late into the night, and the haunting strains of “Zhebiner Hartz” – Nosson’s favorite Nigun, continued to be heard until well after dawn. Many people are saying excellent and amazing things, stories etc. about my extraordinary roommate, I want to just mention to you something about Nosson which I'm pretty sure you don't know, there's lots more I have to say but this is something special. Most people have their "click" meaning their friends who their close with, guys talk and befriend many people but generally speaking everyone has "their guys", that when they need to talk to someone, need advice or help they know they can call. On a daily basis I would here Nosson on the phone with all those people that DIDN'T have a "click" or with some old classmate who is a working bochur and had no social life... Nosson was on the phone daily with them. All the time these guys would come to Florida to visit, and I'm saying the truth here, before they would check in to their hotel they were in yeshiva, it was something like they felt they had to see the person who really cared about them, and only after getting that famous massive smile from Nosson were they able to continue to the hotel. When I was at the levaya and at the farbrengen we made the night of the levaya, all those classmates of mine that I haven't spoken to in years... they were very hurt, crying, and just like me, they felt that they lost their BEST friend..... Who will they talk to now? Who will they turn to for advice? When they need that listening ear who will they call? Just wanted to share that extra ahavas yisrael that Nosson had and I don't know anyone who can match that.